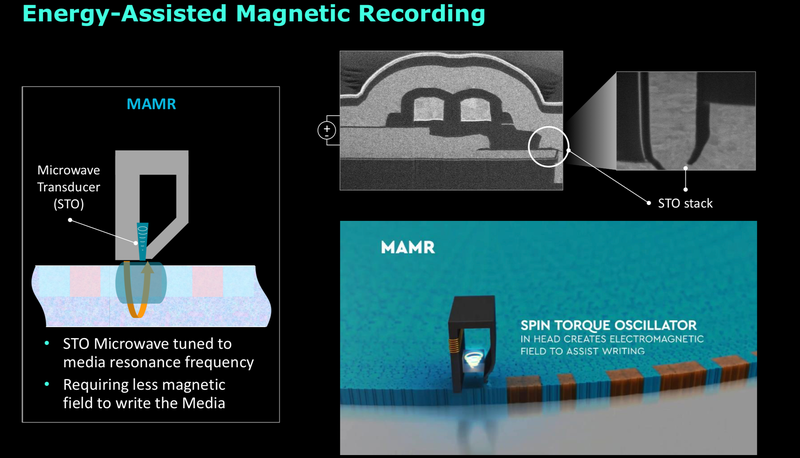 Western Digital revealed recently that it has begun to sample its next-generation hard drives based on microwave assisted magnetic recording (MAMR) technology. The sampling is a prelude to mass production, which will see the first commercial HDDs based on the tech released this year. Meanwhile, the company is working on hard drives featuring two actuators that will arrive in 2020 or later. Overall, Western Digital remains confident in MAMR and expects to launch multiple generations of such drives. In the meantime, the firm is also admitting that it has continued to invest in development of alternative heat assisted magnetic recording (HAMR) technology. “We are sampling our 16 TB [MAMR-based] product today,” said Michael Cordano, president and CEO of Western Digital, at the company’s meeting with financial analysts last month. As expected back in 2017, the first MAMR-powered drives will feature 16 TB capacities and will use eight platters, which was confirmed by the executive during the event. 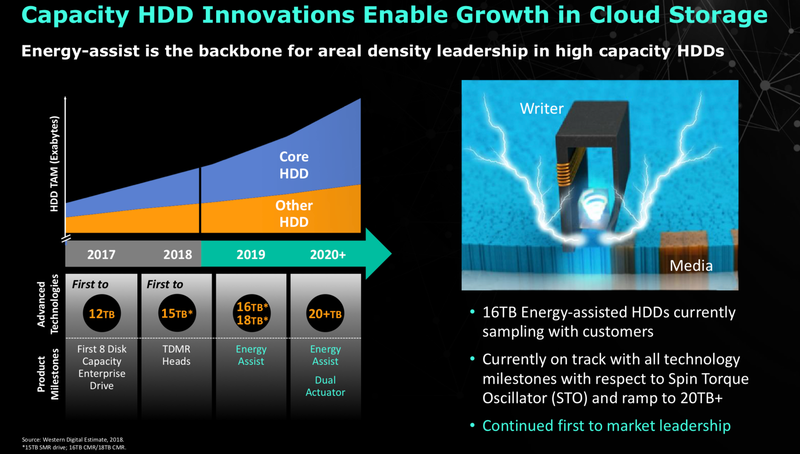 Western Digital’s 16 TB HDD will be aimed at nearline applications and are intended for cloud datacenters as well as enterprises that require massive storage capacities. However Mr. Cordano did not clarify whether the MAMR-powered HDDs were only sampling with select customers (for example, Western Digital’s SMR-based HDDs are available only to select clients), or if they were being offered to a broader spectrum of clients. Not Happy with 16 TB? How about 18 TB? Western Digital has learnt a number of things while developing MAMR and plans to use the technology for many generations to come. For example, one of the company’s slides shows 18 TB HDDs also being planned for 2019. Meanwhile, 20+ TB drives with two actuators to increase per-TB IOPS performance are set to hit the market in 2020 (or beyond), with higher capacities following on later. In general, Western Digital seems to be confident of its implementation of MAMR. The process will use a combination of heads made using its Damascene process, Spin Torque Oscillators (STO) to generate the 20-40 GHz microwaves that lower the coercivity of the media, and the new media itself. The tech has passed all the company’s milestones and it is ready to ramp it this year. But while MAMR will be used for years to come, Western Digital continues to invest in development of its own HAMR technology. HAMR has been investigated by multiple firms, and rival Seagate will be using it for commercial products in 2019. This is a curious step on Western Digital's part, as in initially rejecting HAMR for MAMR, the company once claimed that HAMR was costly to implement and it posed reliability issues. By contrast, Seagate said that HAMR had better scaling when it comes to areal densities. Given this revelation, while Western Digital's path with MAMR seems to be set for the near future, it would seem that the company is going to hedge its bets in the longer term. In which case we may still see a HAMR Western Digital drive yet.